"An extraordinary performance for the benefit of the singing duet Gardel-Razzano and their guitar player companion, José Ricardo, is announced for tonight at the Esmeralda Theater. The first act of "El Distinguido Ciudadano" (The Distinguished Citizen) will be staged by the Apolo Theater Company, a dialogue by Cayol in charge of Alippi and la Poli and a monologue by Enrique Muiño..."
Gardel, in turn, was the author of many famous tangos along with Alfredo Le Pera and only in Paris he came to sell 110 thousand records in one year. He starred in 11 movies in the US. And when death fell upon him in an airplane crash at Medellín (Colombia), he had already recorded about 800 songs. This short account would represent a nearly "official" story of his life. But Gardel is an enigma. Paraphrasing the tango, his birth is still an issue for discussion; his prodigious voice is a real gift and, above all, his memory remains alive in the cities he passed by. His person still summons up essayists, anthropologists, historians and poets, as well as fervent Gardelians, both famous and anonymous. As Ernesto Sábato stated, Gardel's success, before and now, has been linked to the fact that he is "the Man from Buenos Aires". The porteño who tries to discover his authentic identity "will irremediably find Gardel, the main protagonist of tango, which is the most authentic popular expression for the loneliness of the man from the city." Once, the Italian tenor Enrico Caruso, admired by Gardel, told him: "You have a tear in your throat". For researcher Nélida Rouchetto, Gardel "would invent" the tangos. His prodigious voice would become lyrical and deep-throated when he sang "El día que me quieras" (The Day You Love Me), very much differing from the voice heard in his first records, which would sing "Flor de fango" (Mud Flower) was not the same in "Mi Buenos Aires querido" (My Beloved Buenos Aires), nor the one in "Mi noche triste" (My Sad Night) was the same as in "Sus ojos se cerraron" (Her Eyes Were Closed Forever). Writer Julio Cortázar prefers "Mano a mano" (Hand to hand) to synthesize the Gardelian insignia. "If his songs have touched all the records of popular sentimentality, from the unforgivable rancor to the joy of singing for the sake of singing, from the celebration of turf glories to the gloss of the policial event, the right medium on which its art is inscribed forever is this almost contemplative tango, with a serenity that we could say has been lost without recovery... An Argentina already hard to recall is reflected in its voice of compadre porteño, sonorous mirror. Beyond preferences, for all the scholars, Gardel is the tango itself. 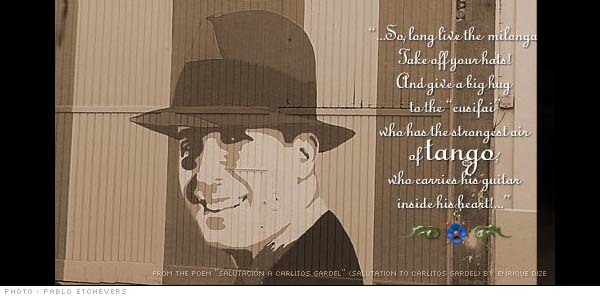 But, as stated by the Argentinian essayist Ricardo Ostuni, it is quite paradoxical that neither did Gardel begin his artistic career with the tango, nor was the tango born with Gardel. to forget about you love. I make believe that you're back. like if you were still here. when it does not see us both. for the absence of your love. to light up my sorrowful night.